“Every child is an artist. The problem is how to remain an artist once we grow up.” He’s probably just the most famous person to have said it. We’re convinced there are many artists who have conveyed the sentiment, including artists realizing why they had failed. The reason children’s art is so magical and buoyant — for them and for us, the viewers — is that it’s the essence of creation. Unguided, unfettered, uplifting. Until someone says to them, “You can’t draw that,” “That doesn’t make sense,” “It doesn’t look right.” The point, early enough, is: there is no wrong way to create. From birth, there is a brain; there are emerging fine motor skills and the tools of creativity; and there are blank spaces to fill with ideas, confluences of color, imagination come to life. 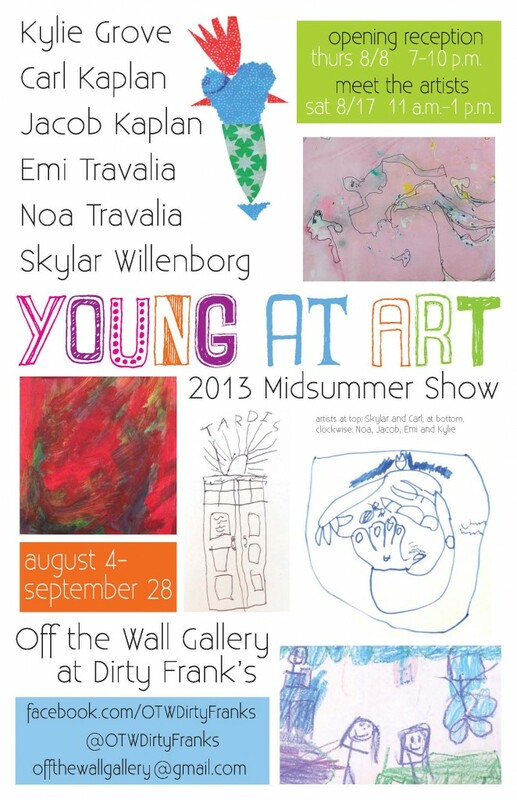 We celebrate the sheer joy of creation with our 2013 MIDSUMMER SHOW, YOUNG AT ART, which opens 7-10 PM THIS THURSDAY and runs through SEPTEMBER 28. Alas, the artists — KYLIE GROVE, CARL and JACOB KAPLAN, EMI and NOA TRAVALIA, and SKYLAR WILLENBORG, all ages 4 to 7 — will have taken their baths by the time we gather and will be fast asleep, with any luck, by the middle of our proceedings. But, in addition to hors d’oeuvres, fine beverages, poured by none other than our curator, JODY SWEITZER, what will be there for us is: THE ART, PURE AND SIMPLE. Take it all in. Take nothing for granted. Accept everything as feasible. And LOVE: the work, the dreamers, the endless possibilities. After all, art is love. So everyone is born loving and creating. Then the world gets in the way. Well, not at Off the Wall and Dirty Frank’s. Not if we have anything to say about it. This entry was posted in Art, Art in Philadelphia, Fine Art Philadelphia, Off the Wall Gallery, Philadelphia Art, Philadelphia Art Galleries, Philadelphia Art Shows, Philadelphia Artists, Uncategorized and tagged Art, Art Installation, ARTISTS Against Hunger, Dirty, DoNArTNeWs, mixed media art, Off the Wall Gallery, Philadelphia, Philadelphia Art, Philadelphia Art News, Philadelphia Art Shows, Philadelphia Artists, Young at Art on August 8, 2013 by admin1.